What TV Shows Do You Think Ended Too Early? As Community fans mourn the cancelation of the cult sitcom, it’s hard not to look back on many great shows the ended too early. So what are some series do you think unfairly met the chopping block? One of the prime examples for me is Freaks and Geeks, which in its eighteen episode span proved to be one of the greatest sitcoms ever. It was a chief pioneer in the dramedy genre, it launched the stardom of Judd Apatow and many actor (including Seth Rogen, James Franco, and Jason Segal), and treated its characters not as one-dimensional stereotypes like many sitcoms today (cough, cough The Big Bang Theory) but as real people. But what about you? Firefly. Hadn’t see F&G, but certainly heard of it. Sorry I missed it. 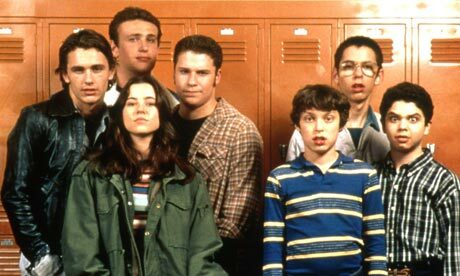 Freaks and Geeks I think is one of the best sitcoms there ever is as well as being a fascinating drama. It ended too soon. Personally, I think that NBC could have given both Believe and Crisis a better chance. On the other hand I a ecstatic that they renewed Hannibal for a third season. By the way, I love the Big Bang Theory. I’m not ashamed to admit that I like stereotypical comedy every now and again. Thanks! I know I’m in the minority about The Big Bang Theory. It’s just not my thing. There is nothing wrong with that. As I have said before-if we all liked the same thing this world would be a boring place. I wished HBO had given Deadwood and Carnivale another season each. Deadwood is an excellent choice. I keep hearing rumors of it returning but I doubt it will. Party Down. I was actually at a film screening with Martin Starr last night, and he said there is a fair possibility a Party Down movie will be made. I realllly hope that happens. Party Down was such an awesome show. I would love to see a movie adaptation. “Pushing Daisies” starring the incomparable Lee Pace as a pie-maker with the ability to bring dead things back to life with his touch. It only lasted 22 episodes. Never saw it but I heard plenty of good things. I totally agree regarding Freaks & Geeks – one of my favourite shows ever. I’m still upset that Carnivale ended early. But I can’t think of much else! Even though the ending of Twin Peaks was heartbreaking, I’m glad it didn’t go on for too long. High five for a fellow Freaks and Geeks fan. I would agree about Twin Peaks. I love the show but it really lost its footing in the second season. Off Centre, really liked that show, unfortunately it was killed during the second season. Also would have loved to see more seasons of Chapelle Show, although I understood his reason for quitting. I would have liked to seen more of the Chapelle Show as well. Thanks for the comment. I was actually really mad when Arrested Development got cancelled. But looking back at season 3, and more recently season 4, perhaps it wasn’t such a big mistake (the show definitely started to fizzle out come season 3). If they cancelled it after season 2 though, oh man. I actually really liked season 4. It wasn’t without its faults (the first few episodes took a while to adjust to as well as the change from an ensemble to Rashomon-style narrative), but it reminded me how much I missed Arrested Development. I agree though I’d be furious if they cancelled it during season 2, that’s the show’s best year. I’ve actually never seen Firefly, looks like I have to watch it.